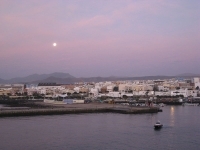 The main town of Fuerteventura, Puerto del Rosario, located on the western side of the island, was once called Puerto de Cabras ('port of the goats'), and even today it is said that goats outnumber people in this whitewashed town. Only recently capitalising on the tourist trade, the streets in charming Puerto del Rosario have been resurfaced and the harbour promenade rebuilt. The main street provides some good souvenir shops and the old harbour area features some attractive examples of Canarian architecture. The home of exiled poet Miguel de Unamuno, which has been turned into a museum, is situated in the harbour area. There are two beaches in Puerto del Rosario: Playa Blancal, to the south, has Blue Flag status and is home to some surf schools, but the currents can get dangerously strong; Playa Chica, right in town, is a small but popular beach with good facilities. A great excursion from the town is a trip inland to Tefia, where the Ecomuseo La Alcogida can be found: an open-air 'village' made of of restored, abandoned buildings, which give visitors an idea of the hard life the locals used to live, scraping out an existence from the land. Some traditionally clad artisans work in the village, making handicrafts.